Home » Retirement Planning » What is a 401(k) Retirement Plan? A 401(k) retirement plan is a tax-deferred, employer-sponsored savings plan that lets employees save and invest part of their paycheck before taxes are removed. Taxes are paid when the money is withdrawn from the account during retirement. Funds in a 401(k) are invested in mutual funds, bonds, and stocks, with the most popular option being target-date funds – a combination of stocks and bonds that slowly become more conservative as you get closer to retirement age. 401(k) retirement plans are considered defined contribution plans, meaning your balance is determined by how much you put into it and how well the investments perform. A 401(k) comes with many benefits, making it one of the most popular options to help you save for retirement. What are the Benefits of a 401(k) Retirement Plan? There are some significant benefits that come with using a 401(k) retirement plan. Tax advantages and employer matching are two of the main advantages. Let’s take a look at some of the most significant benefits. Pretax contributions– The contributions you make to your traditional 401(k) plan are made before the government takes its share. For example, the government usually takes around 20 to 30 cents per dollar for taxes so if you were to save $1,000 each month on your own, without using a 401(k), you’d need to earn around $1,200 – $1,000 plus $200 to cover your taxes. Investments grow freely– Money in your 401(k) retirement plan remains protected from the IRS and any taxes on your investments’ growth. As long as your money stays in the 401(k), you pay no taxes on interest, dividends or investment gains. You only pay taxes when it comes time for you to withdraw funds from the account. Employer matches– Possibly the most popular feature of the 401(k) retirement plan, the employer match is the same thing as free money. Most companies match either dollar-for-dollar or 50 cents per dollar, up to a certain percentage. In other words, if you contribute six percent of your paycheck, your company would contribute six percent as well. Lower income taxes– Pretax contributions to your 401(k) lower your taxable income each year. If you make $55,000 per year and you contribute $12,000 to your 401(k) in a given year, you’d pay taxes on $43,000 instead of the full $55,000 of your salary. What Happens to my 401(k) Retirement Plan if I Change Jobs? Leave it– Although it’s not your best option, you can leave your 401(k) with your old employer. You’ll be subject to record-keeping and other types of fees which can eventually take a significant chunk out of your account’s net worth. 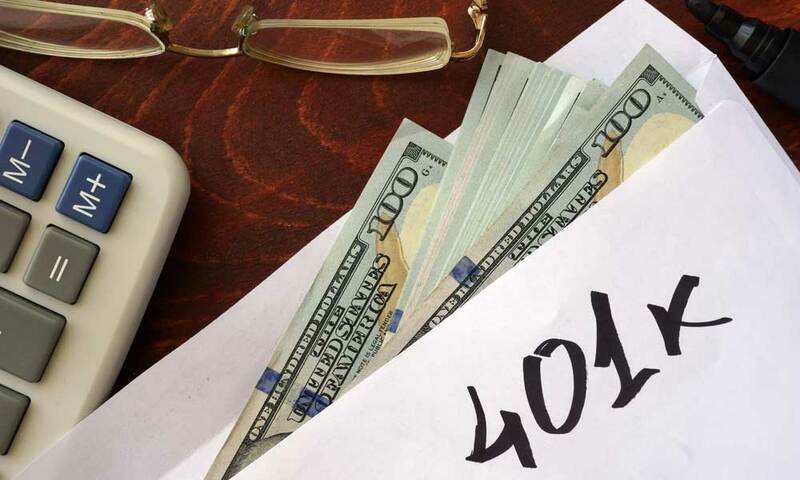 Rollover to your new 401(k) retirement plan– Once you’ve had the chance to look at your new employer’s 401(k) investment options, take a moment to decide if you want to rollover your funds into the new 401(k) plan. If you aren’t satisfied with your new investment options, consider rolling your old 401(k) into an IRA. Rollover to an IRA– Since 401(k) plans come with limited investment options, IRAs have become a popular option because they let you have more control over what you invest in while keeping your funds tax-deferred. To roll your 401(k) into a traditional or Roth IRA, order a distribution form your previous employer (report this on tax form 1099-R). You’ll get a check for the amount of your old 401(k) balance. Once you have your check, you have 60 days to place the money into an IRA. Make sure you report this deposit on tax form 5498 the following tax year. Cash out your balance– While cashing out is an option, it’s highly recommended you avoid going this route. You’ll be missing out on years of tax-deferred compounding that your balance could have been earning. Keep in mind, if you cash out before the required distribution age, you’ll pay a 10 percent penalty fee. Contributions limits for 401(k) retirement plans are subject to change annually. The IRS reports any contribution limit changes for the next calendar year towards the end of the current year. The current maximum amount of money you can contribute to your 401(k) per year is $18,500. If you’re aged 50 or older by the end of the year, you can make additional contributions known as catch-up contributions, of up to $6,000. The maximum employer/employee joint 401(k) contribution limit is $55,000 or $61,000 if your aged 50 or older. High-income earners, those who make well over six figures per year, are at a disadvantage when it comes to how much they can contribute to their 401(k). The IRS has set a current 401(k) contribution limit for high-income earners at $275,000 per year. Some employers have other options for high-earners to help them save additional money for retirement. If you’re a high-income earner, ask your employer about deferred compensation or executive bonus plans. A 401(k) plan ties you to a lot of distribution rules. That’s why many people choose to roll their 401(k) into a Roth IRA before withdrawing any money during retirement. Taking advantage of this option lets you avoid these distribution rules and opens you up to more investment choices than those that come with a 401(k). Aside from the increasingly rare employee-offered pension plans, 401(k) retirement plans are one of the most popular ways to save for retirement thanks to their tax benefits and company-matched funds. If you can contribute at least the amount your employer will match and ideally increase your contributions each year, you’ll be on your way to a significant retirement savings account. What Is An IRA? How Do I Open An IRA? What Is A Gold IRA Rollover? How Much Money Do I Need to Retire?